The increasing amount or capacity of food industry in the future must be able to meet global need in term of food security, food safety and health nutrition. Competition among food industry actors is keep happening and this makes innovation and technology development in food processing become an important aspects to survive in global trade. Based on this, Association of Food Technology Experts (PATPI), SEAFAST Center, Institute of Research and Community Empowerment Bogor Agricultural University (LPPM IPB) and Department of Food Science and Technology, FATETA, IPB organized PATPI-SEAFAST International Conference 2018 with theme “Science Based Ingredients: The Future for Food in Asia” on last October. Chief of PATPI-SEAFAST International Conference 2018, Dr. -Ing. 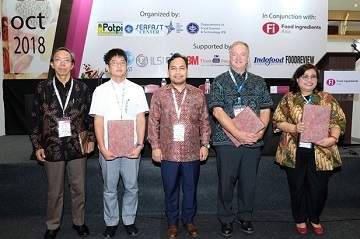 Azis Boing Sitanggang conveyed that this event is a good platform for academics, researchers, government and private party to be connected both in field of research collaboration and community empowerment collaboration related to food science and technology. “Food ingredient is still the main problem in food industry. Production limitation of world’s food ingredients, climate change and population growth has pushed the industry to be more productive and efficient. In this case, academics, researchers and government agencies are expected can play contributory role to create innovations in food sector,” said Dr. Azis. Vice Rector for Academic and Student Affairs IPB, Dr. Drajat Matianto said, in line with this conference, also held the event of Food Ingredient Asia (FIA) 2018. FIA 2018 is one of the biggest food exhibition in ASEAN regional, also is a very good opportunity to participate in that exhibition, because ASEAN is considered contributing about 8,8% (around 640 million people) from world’s population which reflect a very huge market share,” said Dr. Drajat.